There was no finer rest camp in the ETO than the one operated by the Division in the French village of Bains-les-Bains, between the Meuse and Moselle Rivers. While rest camps in more exciting metropolitan areas allowed combat troops to schedule days of unending sightseeing and night-clubbing, at Bains-les-Bains the accent was on much-needed and well-deserved rest. The first contingent of restees, with more than 100 continuous days of combat behind them, arrived at Bains-les-Bains for a week of relaxation on December 7. 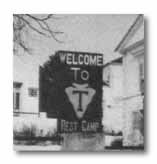 Four months later when the camp was officially closed, the Special Service Officer determined that 5,533 enlisted men and 401 officers had been quartered there. 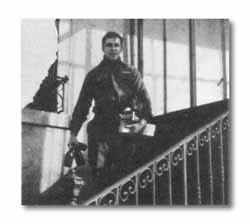 During their stay troops were billeted in five of the towns hotels, each one of them named for a Congressional Medal of Honor winnerthe Hotels Kelly, Logan, Crawford and Wise for enlisted men, and the Hotel Bjorklund for officers. After a hot shower, men shed their mud-stained combat clothing for a complete new uniform. Dinner, prepared by French chefs, followed in the Hotel Kelly, with china replacing mess-kits and with waitresses to serve. 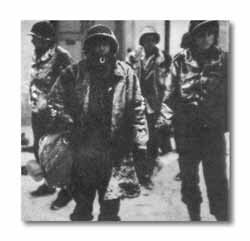 Infantrymen brought the snow and mud of the front with them. After a hot shower and trip to the PX, fatigued fighters felt like new men. Special Service Section, headed by Captain Theodore J. Nykiel, Assistant SSO, aided by two Red Cross hostesses, the Misses Kay McDonald and Candy White, arranged for and supervised a wealth of entertainment throughout the four months. In the ARC corral there were reading and writing lounges, a snack bar, two dances weekly, and special programs; in the Casino theater two movies daily. 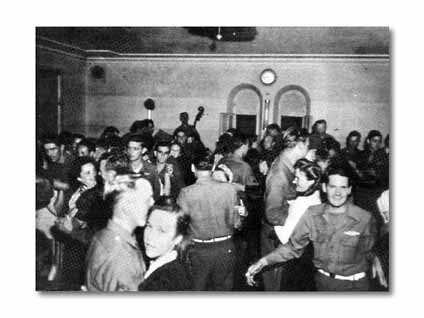 Hard-working hosts and entertainers were men of the 36th Division Band, who in addition to playing a variety of music at meals, for shows and dances, managed the hotels and fulfilled many of the work details to accommodate the visiting troops. 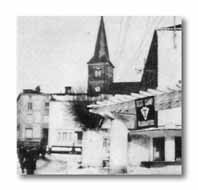 Most of the recreational facilities for the officers were in their own club at the Bjorklund. 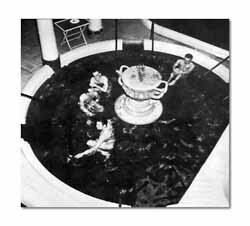 The circular sulphur spring pool was the most popular feature of the rest camp. Water was warm. Mindful of the poverty of sanitation during the preceding months, GIs by popular demonstration selected the Roman Baths as their favorite spot at Bains-les-Bains. In them they bathed for hours and then crawled between white sheets, the first for many of the men in over a year. At least two dances were scheduled each week. The 36th Division Band provided music.